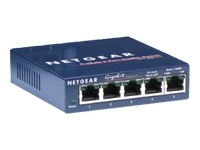 NETGEAR ProSafe Smart Switches fill the gap between unmanaged and fully managed switches. The family of ProSafe Smart Switches is designed for growing businesses that want control over their network without the cost and complexity of a full Layer 2/Layer 3 management implementation. This second generation Smart Switch, FS726T, with affordable built-in gigabit power, easily connects to servers or a Gigabit-speed backbone for a non-stop 10/100/1000- enabled network that can quickly deliver large multimedia, image, and video files. With the utility of 10/100 Mbps ports, 2 copper 10/100/1000 ports and an SFP slot for optional fiber connectivity, growing business networks, classrooms and workgroups can benefit from superior performance and keep up with expanding network needs. This high-performance switch features a non-blocking wire-speed architecture with an 8.8 Gbps switching capacity for maximum data throughput. All RJ-45 ports automatically negotiate to the highest speed and support Auto Uplink technology to make the right link.